There has always been a debate of whether a rugby player could do well playing football, and vice-versa, and we finally have an answer to that question, yes. 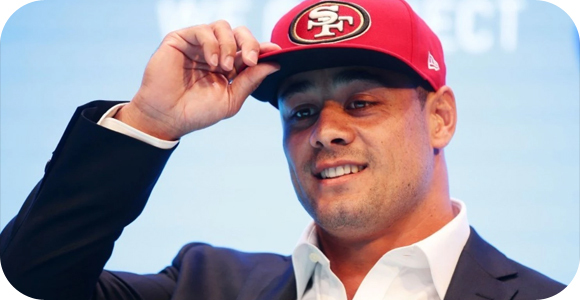 As proof, one of the top rugby players of the world, Jarryd Hayne, has just been signed on to the San Francisco 49ers final roster. For those that know him have probably already seen his skill on the field, and those who have not, should definitely watch how Hayne uses the skill and talent he learned and is not applying it in the NFL. This is a short introduction to how Hayne made his transition, along with a few clips that should have every 49er fan anxious to see what he can do during the 2015 regular season. However, there has never been a successful story related to a rugby player making it in the NFL, which is why Hayne has become the center of attention. He attributes his success so far in the League to his years spent training and playing rugby. As a fan of both sports, you can clearly see how he uses his speed, and that amazing stiff arm block when he is running the ball. Not only that, he does a great job at avoiding the defense, and when necessary he even faces them, something most RB avoid doing. With his solid physique he is able to withstand tackles, grabs, and even deliver a few blows himself. All in all, Hayne is an amazing example of an athlete that can translate the skills and talent necessary for one sport and use them extremely well in another sport. The rugby league is proud that one of their own was able to make it big in football, where the rest of the world can see what a rugby league man can do. We will have to carefully watch him as the NFL season starts, and hopefully we can see some more of that great action we have seen so far.